It’s cool that my students know about my quest for 365 blog posts in 365 days. This week a student asked me if I’d review some books of his if he brought them in. Of course, as long as their somewhat school appropriate. Heck, saves me money! 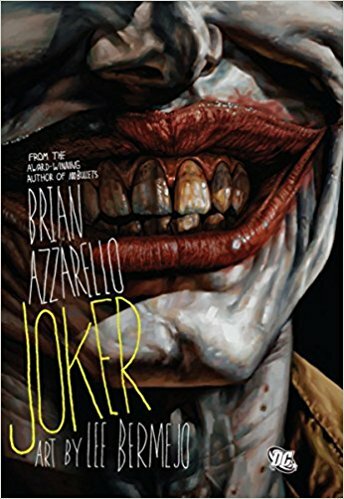 So knowing I am currently doing a run of DC titles, one of my students brought me the 2008 Brian Azzarello, Lee Bermejo…Joker. 2008 was a big year for The Joker. It was the year The Dark Knight with Heath Ledger was released, and there is serious resemblance between the Jokers in each story. This book is unique in that it is a true Joker book. Batman appears in only a small handful of pages at the end of the book. The majority of this tale is The Joker trying to find his place in Gotham after surprisingly getting released from Arkham Asylum. The art is gritty. The story is brutal. It has the feel of classic hard-boiled crime fiction: dark, real, and fast-paced. Compared to the Killing Joke, this Joker book is less cartoon-y, and the realistic Joker might not sit well with some folks. And yes, it does focus on The Joker, but we do have a narrator in the shape of a hench-wheel-man named Jonny. And it is through Jonny that the reader is allowed to explore themes such as greed, fear, power, and dependence. These are themes that would be hard to explore if this were just a Joker book, for The Joker is insane, and the non-rational sides of him do not allow one to explore rational wants and needs. You’ll need your seat-belt for this one.